In the Maelstrom's Edge universe, massive numbers of people are forced to flee ahead of the ever-expanding galactic explosion that is the Maelstrom. 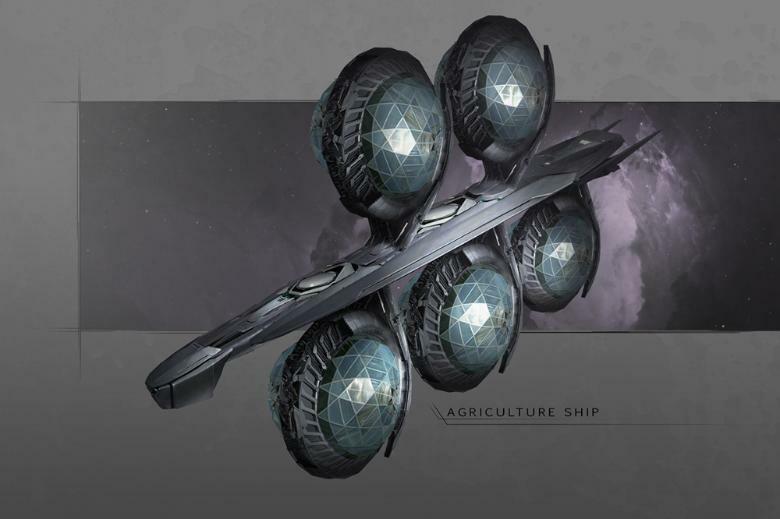 We've previously shown one of the ships used for energy and resource acquisition, but converting that energy into food to keep the population functioning is another challenge all together. While the majority of vessels are equipped with simple algae and fungal vats which can provide a balanced, if unappetising meal, there is a huge amount of variance in space travel cuisine. Many, such as the majority of the Broken, give over entire floors of their vessels to livestock to introduce more options to their food choices. The Epirians tend to produce large volumes of food that can be stored indefinitely, travelling with generations worth of supplies on their largest craft. The most desirable food source are the Automated Crop Ships that traverse the galaxy. Traditionally they were not widely utilised outside of distant terraforming excursions, but the Maelstrom has caused them to be in massive demand. They are a pure luxury which increase the satisfaction of a fleet's populace immeasurable. A constant supply of fresh fruit, vegetables, nuts and more is possible with even a single Automated Crop Ship in a group of survivors, and it is relatively common to see populated ships sacrificed by a fleet if there is a chance to save their crop production facilities when resources run low or dangerous circumstances arise. Nice! Reminds me of the classic starship from Silent Running.